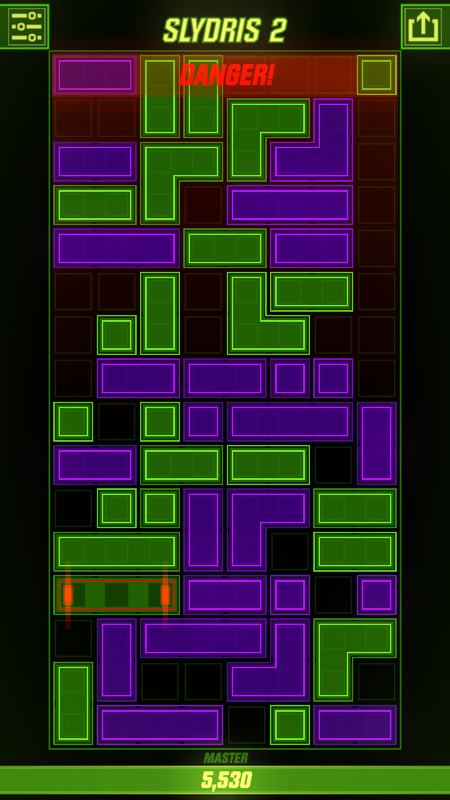 That’s how the main mode plays out anyway, nothing happening until the player slides a block across the screen. At this point, everything waiting at the top and those suddenly floating with nothing underneath… well, I’m sure you know how this stuff works: blocks drop down, lines are hopefully cleared, and more new blocks appear at the top. 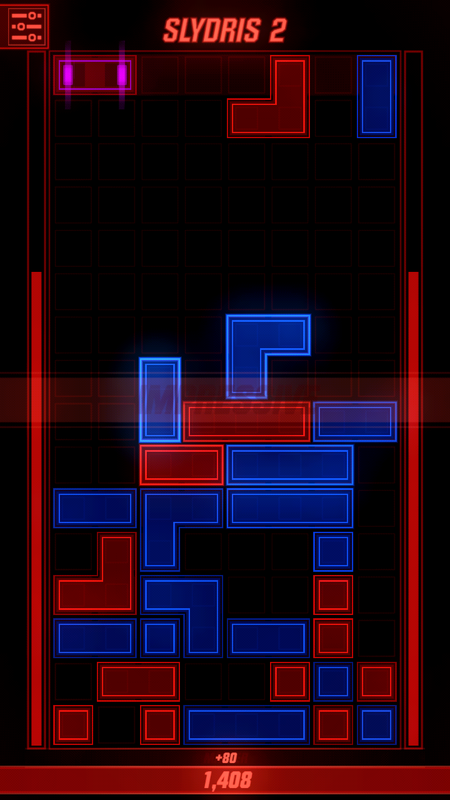 Except in this one, like that of its precursor, multiple blocks will be coming your way after every turn/move made. Some of which even behave differently, either helping or hindering attempts at keeping the upper area clear. An undeniably fun experience, and one that’s only made better by a variety of blocks with unique properties. Some can’t be moved at all while others will shatter any they touch, potentially creating a chain reaction of gaps filled by a lot of 1×1 blocks, resulting in a truly groovy combo. 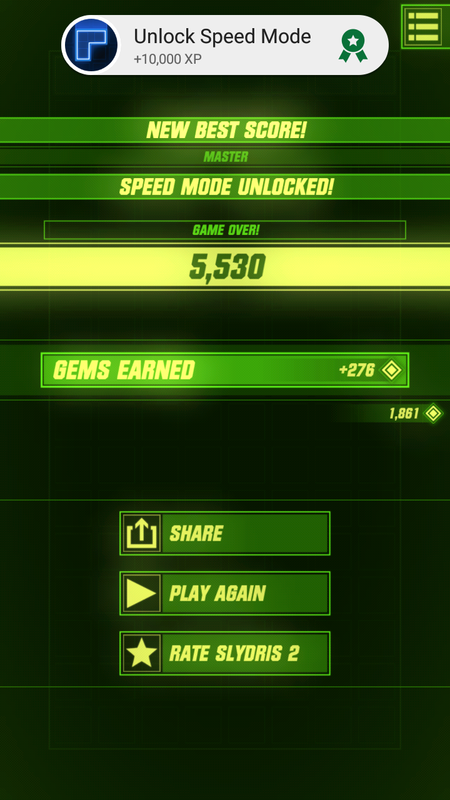 Seeing how this is, for all intents and purposes, a score chaser… combos are truly your new best friend in Slydris 2. Combos and patience, for should you choose to rush without looking at what’s about to fall from the mighty heavens (or top of the screen, I suppose), that dreadful ‘game over’ will come sooner rather than later. Without anything even resembling a high score or more than a tiny handful of gems awarded – neither of which offer any kind of bragging rights. Not thereby saying that the experience is all about strategy, as randomness does also factor into the equation: being dealt blocks you have no need for several turns in a row is not an uncommon annoyance. The fact that you are able to slide any block that isn’t surrounded does help ever so slightly with this, and as the screen continues to fill, your options should hopefully expand. Still doesn’t really enable you to plan ahead much, randomness being a thing, as mentioned already; but at the same time, it is still a nice difference from the likes of the original Tetris, in which you are only able to shift the latest freshness (read: block, singular). 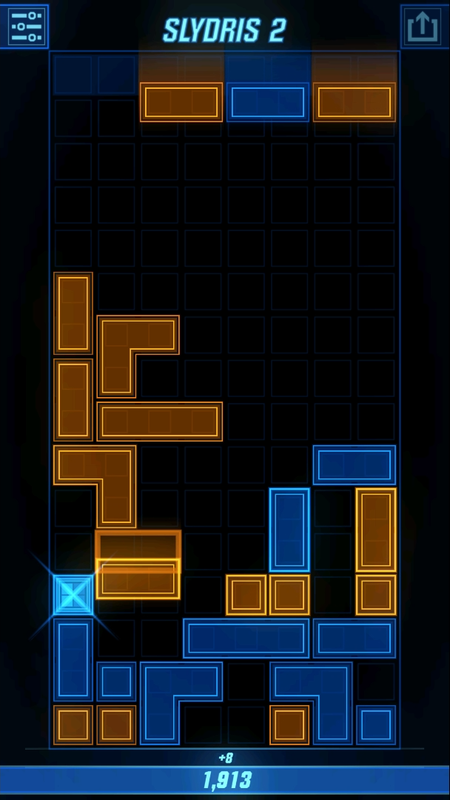 That said, in spite of my constant comparison to Tetris, Slydris 2 is its own thing and in many ways, noticeably different: no way to rotate blocks, save for the odd cube each block takes up three spaces at most, no matter its configuration, and then there are the aforementioned special blocks. Quite a bit to take in, although again, the game doesn’t progress until you make a move (or tap the ‘let the blocks drop’ icon, should it be available). Save for its, to the best of my knowledge, singular unlockable mode, that is. Now, while I’d like to share the story of how I unlocked ‘speed mode’ – which adds a time limit to each turn – I honestly don’t remember what triggered it. That’s what I was going to write here and then move on, anyway. But a quick glance at my achievements reveals the criteria, I’d say, ‘Score 100,000 Total’ popping up moments before ‘Unlock Speed Mode’, so there ya go. Oh, and shortly after this accomplishment, I was finally able to drop an abundance of gems and become a ‘master’, enabling me to begin a run on medium difficulty with a neat 1000 starting score. Neat. Still far from unlocking remaining tiers, but eh, progress is progress. Difficulties are available at all times too, meaning players are never forced to play on the highest they’ve opened up. With those delicious gems. Speaking of which, at the end of each run, these are doled out in a 20:1 ratio. Not easy to come by, to say the least, and seeing how a whoopin’ 5,000 is required to become a champion – third of five ‘ranks’ – those looking to unlock everything are in it for the long haul here. Unless they’re really good, in which case a day or two is likely all they need. People have posted videos with scores in the tens of thousands, after all, completely destroying my 6,249 record (at the time of writing – it will increase, mark my words!). At least both one’s eyes and ears will be treated to something truly lovely while playing, flashy effects popping across the display every time one or more lines are cleared accompanied by a funky soundtrack. A blend that more often than not aids in creating a nice and relaxing experience, as you stare intently at the screen, trying to figure out which block to slide for that next SENSATIONAL (8x) combo. Only to have it not trigger after all because you made a mistake somewhere in the planning. All in all, Slydris 2 is a great example of how to make a quality sequel without needlessly reinventing the wheel and a nice reminder of how not every mobile game is a dull freemium idle clicker or a loot-centric gacha title. Even if the most popular titles on both Google Play and the App Store are, sadly, at least one of those things. So in case you hadn’t picked up on that already, this game is an easy recommendation, one without ads or microtransactions of any kind too. Just hours upon hours of fun, after paying the admission fee. Good stuff. Note: Android version played for this review. Slydris 2 is available on Google Play ($2.99) and iTunes (free, $2.99 IAP unlock). Its soundtrack is on Bandcamp.